Looking for a simple dish that looks fancy AF? 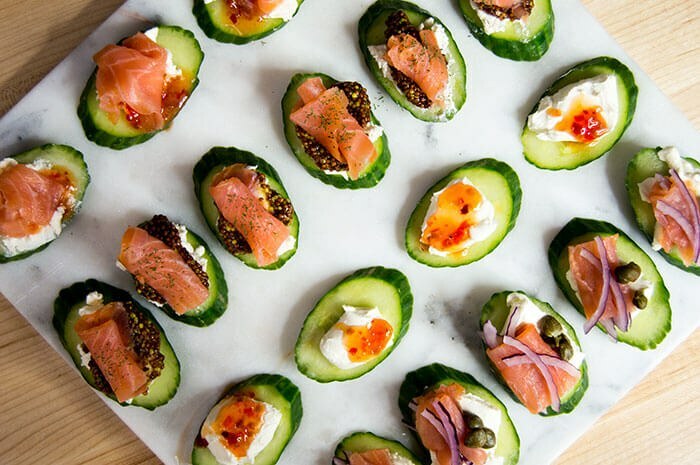 I discovered this easy appetizer at one of our holiday parties and promptly fell in love: cucumber slices with a touch of goat cheese, whole grain mustard, and smoked salmon. I recreated it for my family - and while the cucumber worked well for the more health conscious, everyone demolished the crackers. 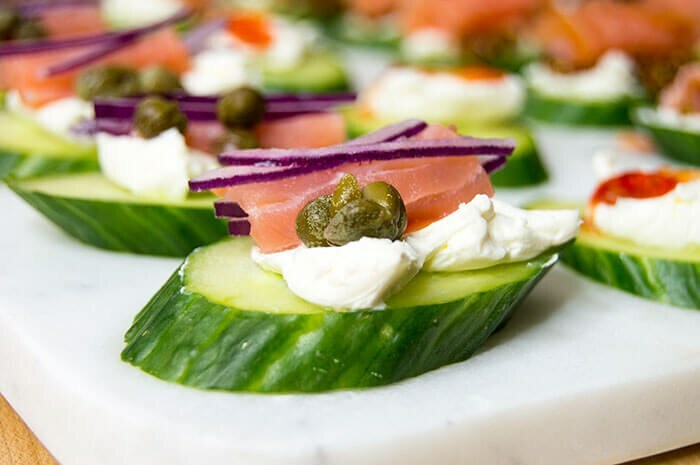 The alternative to my new found love of this fancy cucumber appetizer is simply cream cheese instead of goat cheese. 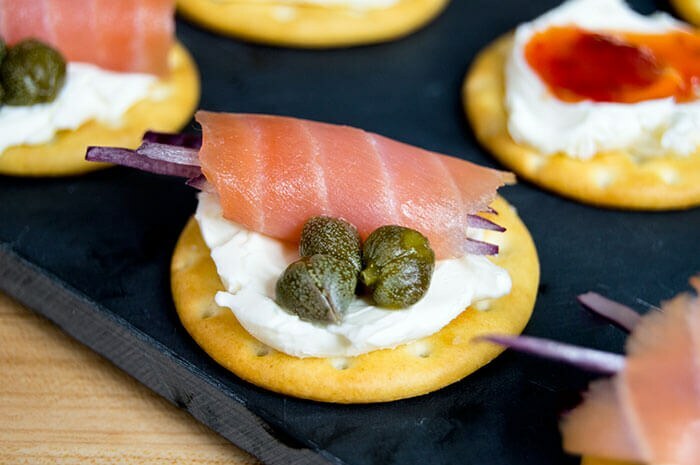 Of course, I had to add my own spin on things and made a "New York lox bagel" cracker, added red onions and capers. I also made a salmon free option dabbed with a touch of hot ginger chili sauce. To make these apps, all you have to do is mix and match your favorite toppings. My spread included gravlax salmon, honey goat cheese, cream cheese, whole grain mustard, capers, sweet thai chili sauce and some dill for garnishing. You can put these ingredients on any kind of cracker you'd like, I prefer the buttery kind! For a vegetarian or healthier option, grab an English cucumber (the thin kind without the seeds!). 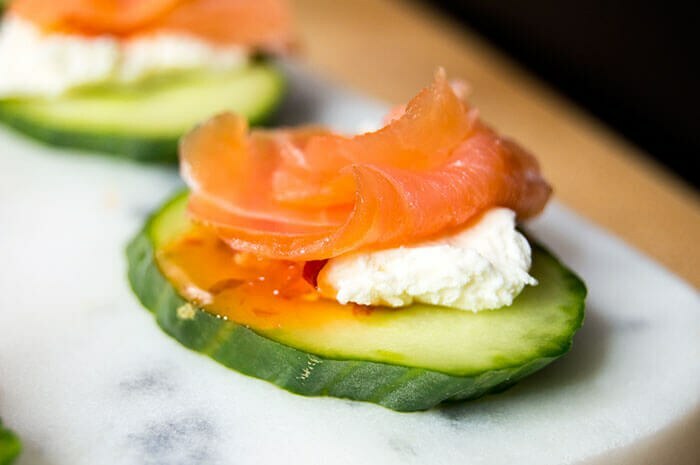 My personal favorite of the hors d'oeuvre was the goat cheese, whole grain mustard, and gravlax salmon on a cracker, followed closely by it's equivalent on a cucumber. 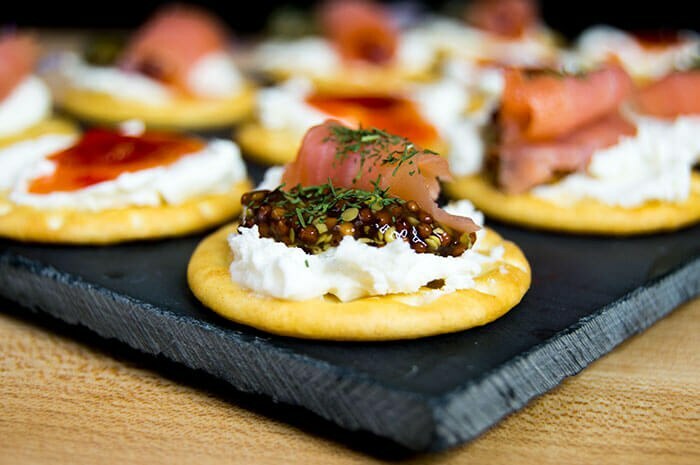 The hit of the party though, was the "New York lox bagel" cracker - topped with cream cheese, gravlax, thinly sliced red onions and capers. I never knew how much I loved capers until maybe a year or two ago when we lived close to a New York style bagel shop with a lox bagel. They're like a little pop of salty deliciousness. For whatever reason, some people take a side eye to smoked salmon like gravlax or lox because it is "raw" - and I can empathize with those who may feel that way. So for those people who simply don't yet understand the amazingness that is gravlax, I made a cream cheese cracker topped with a small dab of sweet Thai chili sauce. Of course, the sweet Thai chili sauce works like, amazingly with the salmon as well, so I couldn't pass up the opportunity to make that too, even if I was the only one eating it. 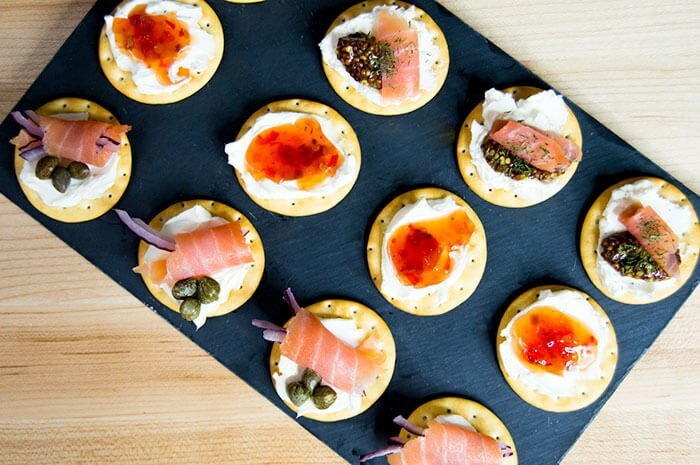 These hors d'oeuvres looks as fancy as they taste, and take really no time at all to stack together - which let's be honest, the less time you spend in the kitchen and the more time you spend enjoying the party, the better! Slice the cucumber at a 45 degree angle to create 1/4 inch thick slices. Arrange the crackers and cucumber slices on separate plates. Cut the gravlax into 1x1 strips. Spread about 1/2 teaspoon of goat cheese on half of the crackers and cucumber slices. Spread about 1/2 teaspoon of cream cheese on the remaining half. "NEW YORK BAGEL" - On crackers and cucumber slices with gravlax, 2-3 capers, and thinly sliced red onion. 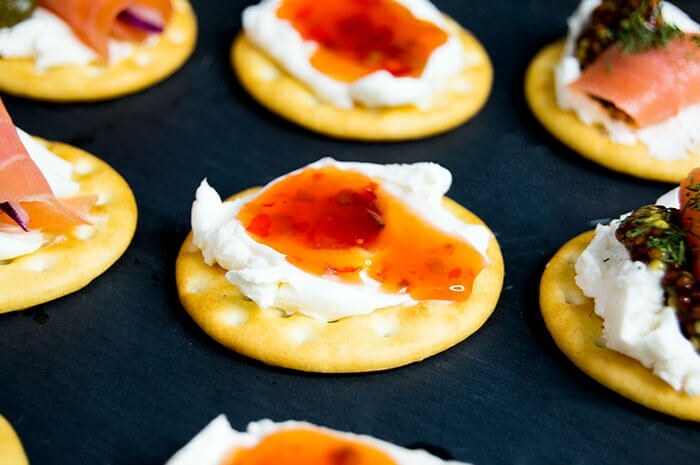 SWEET THAI CHILI - On the crackers and cucumbers with cream cheese, add 1/4 teaspoon of sweet Thai chili sauce. 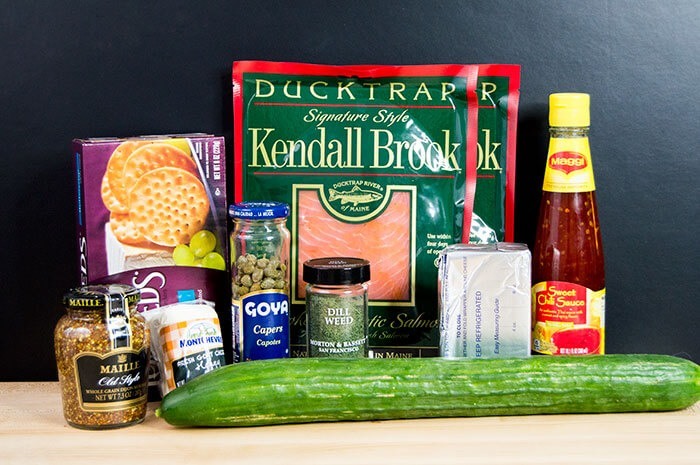 Add gravlax to half, and leave the other half as a fish free option. 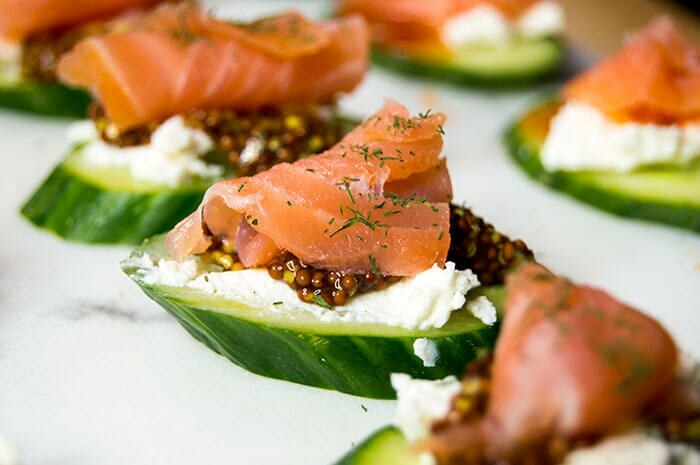 WHOLE GRAIN MUSTARD & GOAT CHEESE: On the crackers and cucumbers with goat cheese, add 1/4 teaspoon of whole grain mustard and top with a rolled piece of gravlax. Sprinkle on dill, as desired.